The Houston Rockets’ center Yao Ming joined forced with WildAid, a conservation group, to help protect shark populations around the world. This Public Service Announcement (PSA), graphical illustrates the cruel fate these sharks suffer. Each year, more than 70 million sharks are used for shark fin soup. In most cases, the sharks are caught, finned, and then simply dumped overboard to die. Back in 2006, Yaho Ming signed a pledge to give up shark fin soup, and has been a Chinese ambassador for WildAid. Being China’s most popular figure Ming is in an excellent position to lead this campaign. 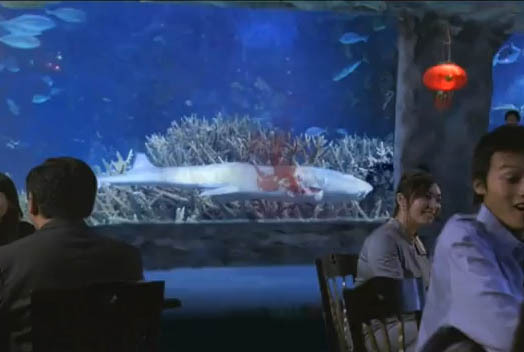 In this PSA, Ming is shown in a beautiful restaurant with an incredible aquarium, being offered shark fin soup. The camera then shows real futage of a live tawny nurse shark with it’s fins chopped off. A recent study conducted by the IUCN Shark Specialist Group showed that 64 species or open water sharks and ray are threatened with extinction. With the combination of overfishing, their late maturity, and slow reproduction, sharks are in extreme danger.